Whoopi Goldberg is one of a very elite group of artists who have won the Grammy (“Whoopi Goldberg,” 1985), the Academy Award (“Ghost,” 1991), the Golden Globe (“The Color Purple,” 1985 and “Ghost,” 1991), the Emmy® (as host of AMC’s “Beyond Tara: The Extraordinary Life of Hattie McDaniel,” 2002 and a Daytime Emmy® for “The View” in 2009) and the Tony (Producer of “Thoroughly Modern Millie,” 2002). She is equally well-known for her humanitarian efforts on behalf of children, the homeless, human rights, education, substance abuse and the battle against AIDS, as well as many other causes and charities. Among her many charitable activities, Whoopi is a Goodwill Ambassador to the United Nations. Whoopi made her motion picture debut in Steven Spielberg’s film version of Alice Walker’s “The Color Purple,” for which she earned an Academy Award nomination and a Golden Globe Award. Her performance in “Ghost” earned her the Academy Award and a Golden Globe Award for Best Supporting Actress. Whoopi has also appeared in such films as “Jumpin’ Jack Flash,” “Clara’s Heart,” “The Long Walk Home,” “Soapdish,” “The Player,” “Sarafina!,” “Sister Act,” “Made in America,” “Corrina, Corrina,” “Boys on the Side,” “Eddie,” “The Associate” and “Ghosts of Mississippi,” “How Stella Got Her Groove Back,” “Girl, Interrupted,” “Kingdom Come,” “Rat Race,” and “A Little Bit of Heaven.” She has voiced characters in such animated features as “The Lion King,” “Racing Stripes,” “Doogal,” “Everyone’s Hero” and “Toy Story 3.” She was part of Tyler Perry’s all-star film adaption of “For Colored Girls….” and will be seen in the upcoming Lifetime Original Movie, “A Day Late and a Dollar Short,” which she also executive produces, as well as Paramount/Nickelodeon Movies’ “Teenage Mutant Ninja Turtles,” which opens next Summer. On television, Whoopi appeared for five seasons on “Star Trek: The Next Generation,” co-starred with Jean Stapleton in “Bagdad Café” and hosted her own syndicated late-night talk show. She appeared in the Emmy® -nominated HBO drama, “In the Gloaming,” directed by Christopher Reeve, as well as “The Wonderful World of Disney’s Rogers & Hammerstein’s Cinderella” and “A Knight in Camelot” and appeared in the mini-series “Alice in Wonderland” and “The Magical Legend of the Leprechauns.” She starred in the NBC sitcom, “Whoopi,” which she executive produced, as well as the television movies, “It’s a Very Merry Muppet Christmas Movie” and Showtime’s “Good Fences,” which she co-produced with co-star Danny Glover. She produced and appeared on Nick Jr’s “Whoopi’s Littleburg” and guest starred opposite Benjamin Bratt in A&E’s “The Cleaner.” Whoopi has been seen recently in a guest spot on ABC’s “666 Park Avenue,” and a recurring role on “Glee.” She currently appears on ABC’s Emmy® Award-winning “The View,” for which she has won a Daytime Emmy® Award. 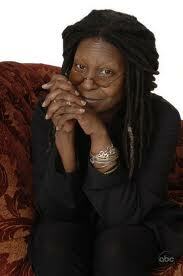 As she has in every other facet of her career, Whoopi has made her mark as a producer. She executive produced the Lifetime original drama series “Strong Medicine,” the longest-running original drama created for basic cable and the first cable show to go into syndication. From 1998-2002, she executive produced and appeared in the center square on the Emmy® Award-winning “Hollywood Squares.” She executive produced the Lifetime original movie, “What Makes a Family,” Showtime’s “Ruby’s Bucket of Blood” and executive produced and starred in the TNT Original Movie, “Call Me Claus” and the Showtime original, “Good Fences.” She produced the documentary short, “Coach,” about legendary coach C. Vivian Stringer, for ESPN’s “Nine for IX” series. Upcoming projects include the documentary “Whoopi Goldberg Presents Moms Mabley,” which premiered at the 2013 Tribeca Film Festival and debuts on on HBO in November, marking Whoopi’s directorial debut, as well as “Lounge,” a new series for Nick Jr’s NickMom network. Whoopi has appeared on many television series and specials, including her own HBO specials, three-time host of ABC’s “A Gala for the President at Ford’s Theatre” and nine “Comic Relief” telecasts with Billy Crystal and Robin Williams. Whoopi received Emmy Award nominations for hosting the 66th, 68th and 71st “Academy Awards” telecasts and returned to host the 2002 telecast at the new Kodak Theatre. In 2008, Whoopi hosted the Tony Awards for the first time. She returned to Broadway in 1997, garnering rave reviews in “A Funny Thing Happened on the Way to the Forum.” In 2001, Whoopi returned to her performing roots, on tour for the first time in over 10 years, performing one-night-only engagements across the U.S. In 2003, Whoopi produced and starred in the title role of the Broadway revival of “Ma Rainey’s Black Bottom.” She commemorated the 20th anniversary of her original one-woman show with a Tony-nominated engagement production on Broadway last year and the HBO broadcast of the show was nominated for an Emmy Award. She recently appeared in the hit Broadway musical “Xanadu” and made her West End stage debut in a special limited run as Mother Superior in “Sister Act: The Musical” in August, which she also produced. In 1992, Whoopi made her debut as an author with her first children’s book, “Alice.” Her second literary endeavor, simply entitled “Book,” became a bestseller in the U.S. and around the world. Hyperion Books published “Whoopi’s Big Book of Manners” in 2006 and launched the “Sugar Plum Ballerinas” book series for young readers in 2008 with “Plum Fantastic,” followed by “Toeshoe Trouble,” “Perfectly Prima” and”Terrible Terrel.” “Is It Just Me?” is her most recent book for adults.